Dillon Peters pitched five scoreless innings for the University of Texas against Oklahoma State in the 2014 Big 12 Tournament, but that turned out to be the left-hander's final college game and last of any kind for a while. Peters wasn't able to pitch for the Longhorns in the NCAA Tournament and the decisions was made before the Draft that he would need Tommy John elbow surgery. As timing goes, it certainly wasn't the best for the former Indiana high school player of the year. "Teams told me they were still interested in taking me, but that it would be for a big pay cut," Peters said. Projected to be gone no later than the third round, Peters fell to the 10th round and had to settle for a bonus of $175,000 from the Miami Marlins instead of the seven-figure deal he once might have dreamed about. It looks like Peters might be able to recoup some of that revenue loss in the future, though. 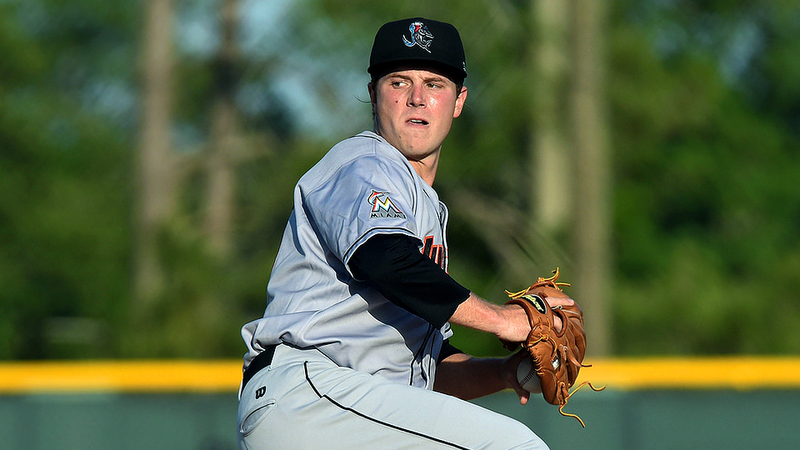 Peters made his Minor League debut last season less than a full year after the surgery and is having a breakout campaign for the Jupiter Hammerheads in the Class A Advanced Florida State League. "Everything has gone great since the surgery," the 23-year-old said. "I didn't have any setbacks and I learned a lot rehabbing with older pitchers. I think I was better prepared to get started than I would have been coming straight from college." Peters, ranked as the Marlins' No. 15 prospect, won his last four starts in July and was 10-6 with a 2.61 ERA in 19 starts for the Hammerheads. He had 85 strikeouts to just 15 walks in 100 innings and a WHIP of 1.13. Peters' command was the slowest to come back, but he is putting all three of his pitches where he wants to now and his fastball has had an increase in velocity from where it was in college. "I threw 91-93 at Texas," he said. "Now I'm 93-95 and up to 96." Peters uses the fastball to set up his plus curveball and he also has a circle change. "Fastball command is the key," he said. "I want to get ahead of the hitters and stay there." Peters is just 5-foot-9, but he's always pitched much bigger. "I've heard all my life about my lack of height," he said. "There is nothing I can do about it except go out there and compete to show that it doesn't matter." The Cleveland Indians took a chance and picked Peters in the 20th round of the 2011 Draft, but he had made it clear he wanted to pitch at Texas. "I wouldn't have signed for $2 million," he said. "I wanted to go to Texas, and I have no regrets at all." Peters was 6-3 with a 1.97 ERA as a sophomore for the Longhorns and then 7-3 with a 2.13 ERA as a junior before he felt discomfort in his elbow in the Big 12 Tournament. Two years later, the eventual Tommy John surgery looks like just a temporary setback. Just settling in: Tampa shortstop Gleyber Torres had a couple of two-hit outings but was batting .208 with four walks after his first six games in the New York Yankees organization. The 19-year-old from Venezuela was the key return from the Chicago Cubs in the trade of Aroldis Chapman and is ranked No. 24 among MLB.com's Top 100 Prospects. Torres, who had a .359 on-base percentage and 19 stolen bases for Class A Advanced Myrtle Beach of the Carolina League before the trade, was ranked as the No. 1 prospect with the Cubs and was No. 1 with the Yankees until the acquisition of outfielder Clint Frazier from Cleveland in the Andrew Miller deal. Power recharged: Lakeland outfielder Christin Stewart homered in back-to-back games July 27-28 at Dunedin, raising his Florida State League-leading total to 23. Detroit's No. 3 prospect had just two homers in July before connecting July 20 at Fort Myers. The first-round pick by Detroit in the 2015 Draft out of the University of Tennessee was batting .261 with a .404 on-base percentage and .534 slugging mark. Stewart, 22, also led the league with 65 RBIs and tied for first with 74 walks. He hit seven homers in April and eight in May before slowing to three in June and five in July. Doing double duty: Daytona's Jimmy Herget saved both games in a doubleheader sweep of Bradenton on July 29 to increase his FSL lead. The 22-year-old right-hander had 19 saves in 20 opportunities, is 3-3 with a 1.54 ERA in 39 games and had struck out 64 in his first 46 2/3 innings while walking 18. Opponents were batting .187. Herget was a sixth-round pick by Cincinnati in the 2015 Draft out of the University of South Florida. Back in win column: Right-hander Sean Reid-Foley bounced back from his only loss with Dunedin to defeat Jupiter on July 30, allowing just one hit and a run over 6 2/3 innings. Toronto's No. 2 prospect walked four but struck out nine. Reid-Foley, 20, was 6-1 with a 1.95 ERA in nine starts for Dunedin after going 4-3 with a 2.95 ERA in 11 games for Class A Lansing. The second-round pick by Toronto in the 2014 Draft had 127 strikeouts to 37 walks over 113 1/3 innings with the two teams. Reid-Foley is No. 91 among MLB.com's Top 100 Prospects.